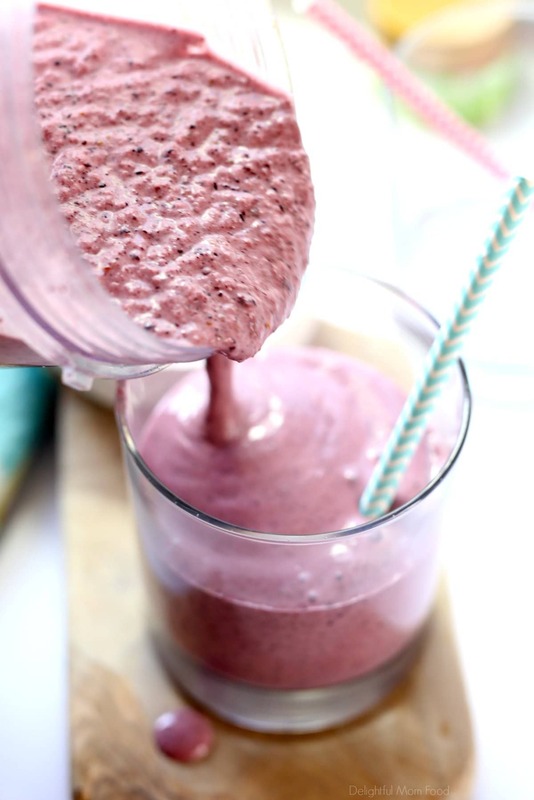 This glowing anti inflammatory matcha berry smoothie is made with anti inflammatory green tea powder, berries and all natural plant based ingredients! Recipe from Madeline Given’s Anti Inflammatory Diet Cookbook! What is it about a gorgeous smoothie that just makes you feel so clean and lean from the inside out? Some people are big smoothie fans first thing in the morning. Is that you? Or are you more of a heavy coffee drinker with a fluffy pastry nearby? Either way, they can still be healthy when consumed in moderation. There certainly are foods that should be eaten if you are dealing with inflammation and gluten is not one of them! No matter what time of day it is it is important to consume nutrient-dense foods to decrease inflammation, balance hormones, provide clear skin, enhances energy levels and just makes ya feel gosh darn good all around! When you feel good, life feels good and you have more energy to do the things you love! 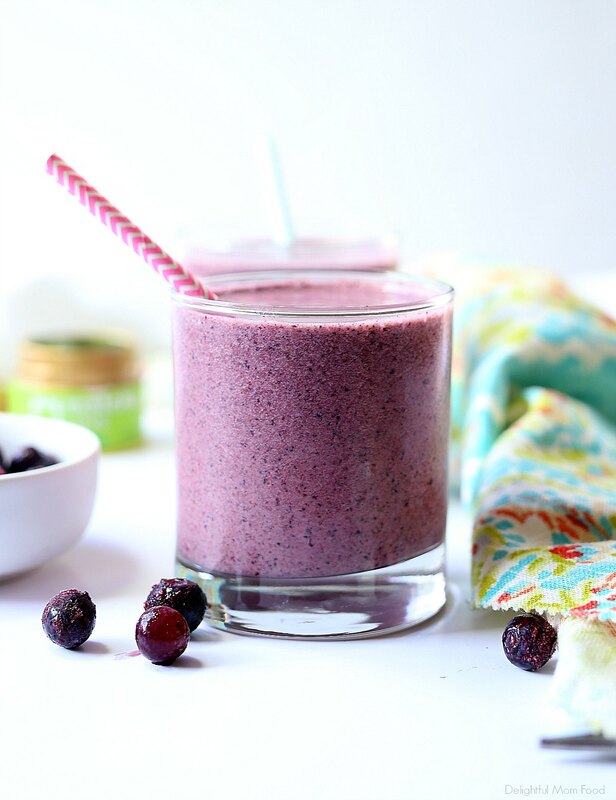 This matcha berry smoothie is one that makes you feel so lean and radiant after drinking it! We have been super obsessed with matcha lately. Well, maybe just me. I have been having matcha every morning in place of coffee for the past month to help balance out my hormones. 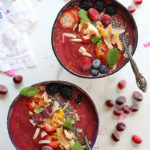 This matcha smoothie bowl recipe is a favorite breakfast treat of mine and now so is this matcha berry smoothie! My friend Madeline of Madeline Nutrition just launched her second cookbook! Whoot, Whoot! I am so proud of her and the knowledge for healing and finding balance within the body that she provides in her cookbooks. Madeline’s new book The Anti Inflammatory Diet Cookbook offers valuable recipes to help reduce inflammation of the body. Inflammation is rough if you have yet to experience it. It is the leading cause to joint pain, arthritis, GI flair-ups, fatigue and even head aches. 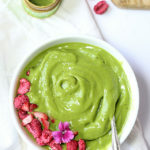 You can find this matcha smoothie recipe in her cookbook along with tons more tasty smoothies, meals, dressing and soups that take less than 30 minutes to make! My mom and sister both have arthritis and it is tough boat to be in. Our bodies are sacred like gold and all we should want them to do is thrive and keep moving forward. Yet how frustrating when the body hinders what the mind wants. Our bodies are a machine we are blessed to be given. Use it well and care for it well. Eating a diet with anti-inflammatory properties is one way to care for your body and increase energy levels. The more you know how to manage inflammation through a real food diet, the easier it is to keep moving forward and conquer the situation. But where to start? Start with eating proper foods daily like a healing and cleansing smoothie plus follow this list of anti-inflammatory foods. Fruits and berries such as blueberries, cherries, strawberries and oranges. Nuts such as almonds, walnuts, cashews and pecans. Leafy greens such as spinach, kale, chard and collard greens. Olive oil and fish oils. Seafood such as salmon and tuna. Herbs such as turmeric and ginger. Has antioxidants! 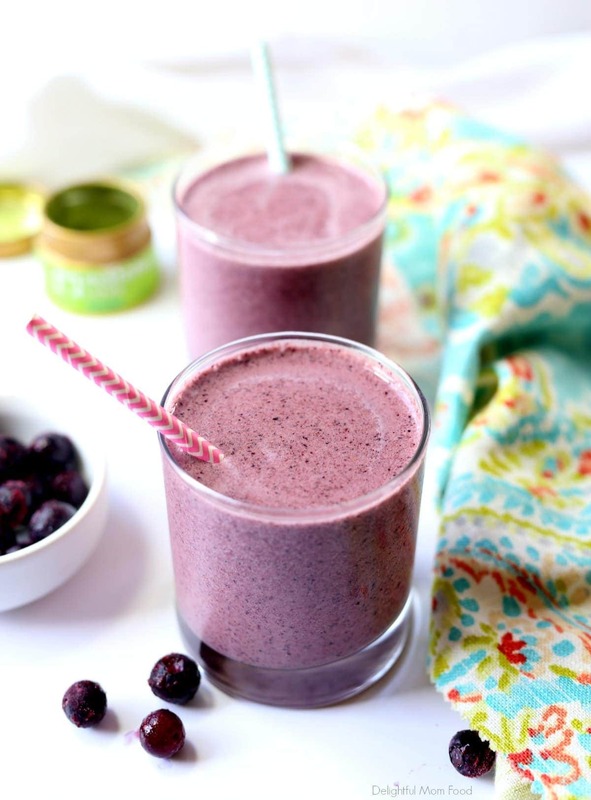 It is packed with antioxidant boosting power from berries and matcha green tea powder. Get extra protein! Contains added protein from plant based powder or whey powder. It is dairy free! Just use your favorite plant based milk. Coconut has added healthy saturated fats, almond milk has energizing B vitamins and nutrients and cashew milk has the creamiest taste! Matcha also detoxes the body of toxins, aids in digestion and provides sustainable energy that does not cause energy drops like the caffeine in coffee does. All the recipes in The Anti Inflammatory Diet Cookbook are amazing! They are hassle-free and also offers lifestyle tips for everyday activities. 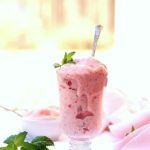 My boys and I love these recipe as you can see from Curren’s face as he slurps away his smoothie. I highly suggest you check this book out! One lucky reader gets to win The Anti Inflammatory Cookbook with one of my silicone muffin pans! Easy baking and 30 minute meals all in one bundle! The giveaway ends next Thursday and a winner will be selected at random and emailed:-). You will want to make these winning recipes all the time, I promise! Please pin to Pinterest, spread the word and share with your friends so they can enter to win too! Good luck! 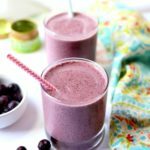 This glowing anti inflammatory matcha berry smoothie is made with anti inflammatory green tea powder, berries and all natural plant based ingredients! Recipe from Madeline Given Anti Inflammatory Diet Cookbook! 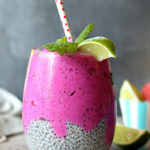 In a blender, blend the nut milk, blueberries, banana, protein powder (if using), matcha, chia seeds, cinnamon, ginger, and salt until smoothie. Pour into two glasses and serve immediately. Nutrition calculated based off almond milk. A pinch of salt is not included. Recipe republished from Anti Inflammatory Diet Cookbook with permission from the author. This recipe looks great and I can’t wait to try it for myself! 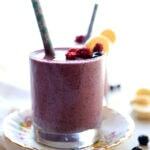 Oh that smoothie looks amazing! I pinned it so I can make it later. Thanks! Making this for my morning smoothie today! I love matcha. The Recipe looks great and I just subscribed. Thanks for the great giveaway. This looks so yummy! What kind of matcha powder do you buy? Silicone muffin pans are so much better than the old tin ones! So unbelievably good! I can never get the porportions quite right when I’m guestimating, but this was just perfect. Plus, no flavor is too strong — not too much tea, not too much protein, not to much banana — great! Thank you so glad you enjoyed this matcha smoothie! would love to hve you share some stories/information. I know my subscribers would appreciate your work. Instead of milk, could you use vanilla yogurt? Yes, you can use vanilla yogurt but it might get too thick to blend. If it is just add a splash of water to get the right consistency.